I went to a wonderful dinner last week, here in New York, to celebrate the opening of a friends exhibition. The setting was spectacular – high above the west side highway, with sparkling views of lower Manhattan and the Hudson River. There were 10 long tables, set with white linen table cloths and candlelight, citrus coloured tulips, champagne and the most delicious food I’ve had in a long time. One of the starters was this beet and goat cheese ‘parfait’. I was so blown away at how beautiful it was, that I came home to try it for myself. It turns out it’s very easy, just a little time consuming, but worth every second. 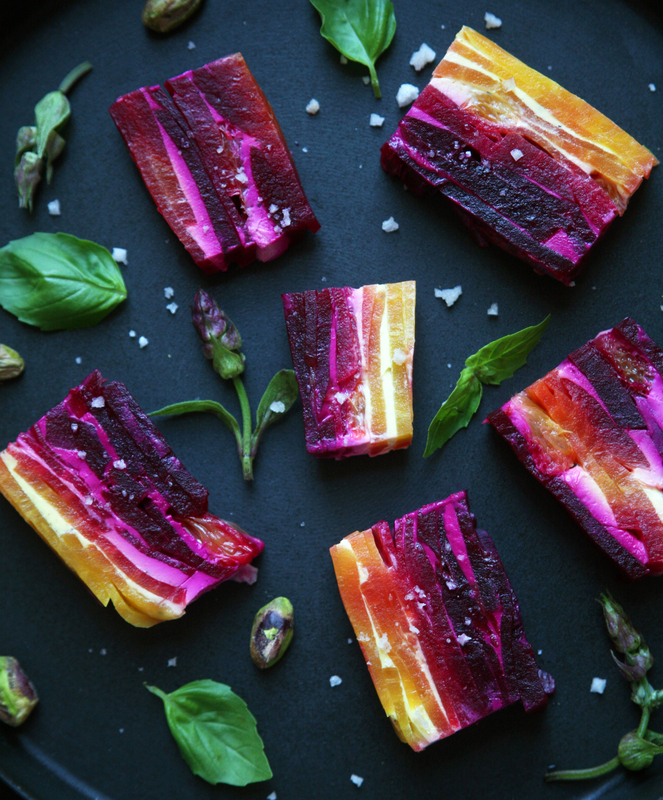 The beauty comes in the use of different coloured beets, which in turn stain the goat cheese, producing these wonderful jewel tones. The recipe is below, but since I made it up as I went along, the quantities are not exact, just a ball park. About 12 beet roots, in as many different colours as you can find. Cook the beets in boiling water until soft, about 30 minutes. Line one of the bread tins with plastic wrap leaving some overhang to fold over once the terrine is completed. Start layering the beets and goat cheese, as if you were making a lasagna, seasoning with salt and pepper and a small drizzle of olive oil between layers. Start with the lighter coloured beets first, ie golden beets, followed by a layer of goat cheese (don’t worry if you don’t make an even smooth layer. It’s pretty hard to do that with goat cheese any way), followed by more golden beets, until they are finished. Then repeat with the red beets and goat cheese, making sure that the last layer will be the beets. Don’t worry if you haven’t reached the top of the bread tin. If you do, that’s great, but if you don’t it really doesn’t matter. Once you have finished the layering, fold the plastic over to seal. Now the trick is to place a weight on the terrine so it compresses. I did this by placing another bread tin the same size, on top of the terrine, and placing a can of corn, or beans, or whatever can you have to act as the weight. Place in the fridge for at least 2 hours, or over night. When you are ready to serve, pull the terrine out of the tin on to a board. Unwrap the terrine and carefully slice (with that very sharp knife), making each slice about 1/2 an inch or 15mm thick. I trimmed the edges to make them nice and neat, but you don’t have to. Using a spatchula, place the slices on a long platter and decorate with basil leaves. I added pistachios and sage flowers, but any nuts and edible flowers will do. Whatever you think will look pretty. Finish off with a sprinkle of Maldon Sea Salt. Serve with crusty bread, and a crunchy arugula salad. I wish I could say don’t bother with the golden beets if you don’t have them, but it’s the different colours that make it so gorgeous. Your photograph is stunning! This sounds like it would be really tasty too. Thank you for kind words Shareba! It really is very delicious….you can’t go wrong with goat cheese and beets, and when you add nuts and basil leaves….heaven! I am making this as I type! The beets are finally all done and cooling. I mixed some cream cheese with orange and cranberry goat cheese! I can not wait to finish this project! I work on a food truck in Houston called The Ladybird and we fry beets!! They are out of this world good! Thanks for sharing! I do have a blog and I just wrote one for this. I don’t update near as much as I should but this was so gorgeous I had to share it!! Thank you for the inspiration!! Reblogged this on Nourish-In Foods. These are absolutely stunning! I cannot wait for fall’s beet bounty. Perfect for a dinner party. Had to share this exquisite visual delight on my Facebook page! So happy to have discovered you and your beautiful blog. What an incredibly beautiful dish! I’ve pinned the recipe and I’ll be sharing the link fwd on FB and Twitter next Meatless Monday. Thanks. Made this this weekend and it was great, but I would change two things. Next time I will roast the beets; boiling them caused them to lose some of their color. Second, I will put the darker color on the bottom. Some of the dark beet juice ran to the bottom and lessened the contrast of the colors. But this was a big hit. Ok, so I made these today. I added a little touch of honey, and a tiny amount of fresh chopped thyme. We’ll see! These are so gorgeous that I want to make them, but I can’t stand goat cheese. Any suggestions for an alternative? I knew as soon as I saw this recipe and photo that I had to make it right away. They came out stunningly beautiful and delicious. Everyone loved them. They weren’t terribly hard to make either. I used homemade rosemary goat cheese. I steamed the beets instead of boiling. With boiling, many of the nutrients seep into the water. I followed an earlier commenter’s advice to layer the dark beets on the bottom so their color doesn’t bleed into the light beets. It worked nicely. I will definitely be making this again. It is a perfect showstopper for parties. Thanks for the great recipe! So beautiful and creative – making this for our weekend festivities. Thanks for posting (gorgeous picture, too)! I did this with cream cheese mixt with a bit of sourcream to make it more spreadable and it turned out great! Thank you for this colorful and delicious dish! May I share this?? I love it but don’t want to share if you are not ok with it. Thanks!! !